We offer the best and most luxurious party buses Niagara tours, Toronto to Niagara Falls and more for local and out of towners. We can help you to get the best time of your life with amazing party in bus and limo services. Have you ever partied in a bus? Well, you must have missed the most amazing experience of your life then. We are one of the best professional bus party services in Niagara Ontario and arrange the best parties for every occasion. What is a Bus Party? Partying in a bus is a different and amazing experience. All you have to do is to rent a bus for the party and turn up on the day of the event. All the arrangements of the party would be done by us so you can cruise around the beautiful city. You can even plan for a theme party based on the requirement and we would arrange all the facilities for the same. The parties can be for the range of occasions like birthday, anniversary, grad day, friendship day and even more. Every time you do not need an occasion for a party and we can make your outing and togetherness, the most memorable ever in your life. We can offer multiple services in the bus party that make your experience the most amazing. We decorate and make the luxury bus perfect for your partying experience. We understand that music is the soul of any party and our surround system for the party is as amazing as it is in the club. You can dance to feat and cheers with your friends. We have special stocked bar installed at the bus so that you never go dry. We have the best chauffeurs in the city who can drive you safe and make things pretty easy for you. Don’t worry about the internet as we provide the dedicated internet services for you. So, don’t worry about sharing the photos and posts on social media as well. 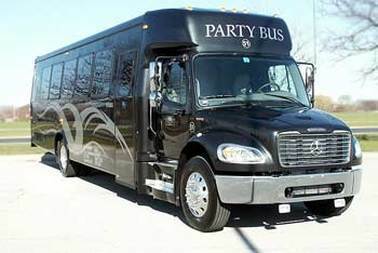 We have dedicated Bus Party services for all the enthusiasts. Apart from the bus services, we have Limo services that can arrange parties for a small group as well. You can book Limo for the special wedding as well. If you are coming to Niagara, then book a Niagara tour with our company. The Limo services can be used for any service you want. We arrange the bus party and Limo Parties for any occasion and as per the requirement. You can get the highest quality of service with the excellent condition of the vehicles and most reasonable and affordable rates in the city. We work hard to make your memorable day even more fascinating and you are always welcome your suggestions and feedback. We encourage our customers to book the event and vehicle well in advance to ensure that the last minute hassle is avoided. You can contact us for booking and any further details required for party and services.